an understanding of Arabic in a variety of contexts knowledge of Arabic vocabulary and structures transferable language skills the ability to communicate effectively in Arabic awareness and understanding of countries, cultures and communities where Arabic is spoken. 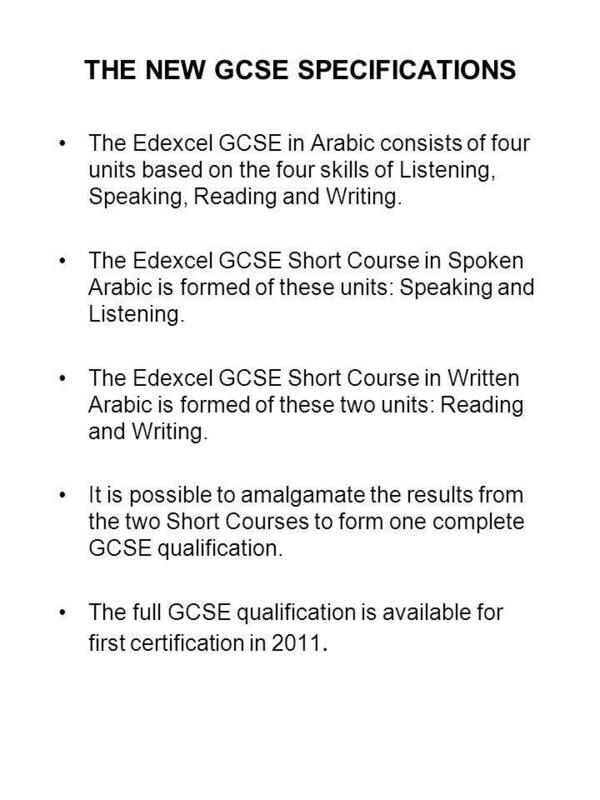 The Edexcel GCSE in Arabic consists of four units based on the four skills of Listening, Speaking, Reading and Writing. 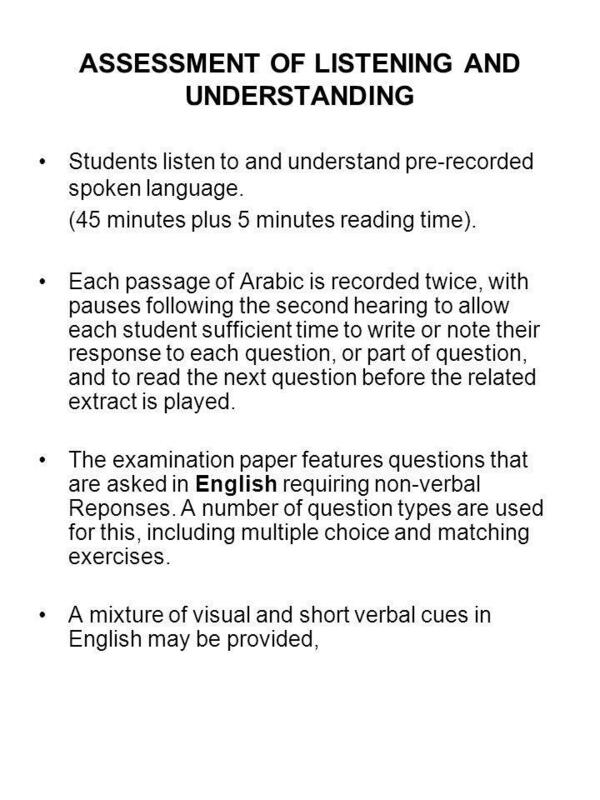 The Edexcel GCSE Short Course in Spoken Arabic is formed of these units: Speaking and Listening. 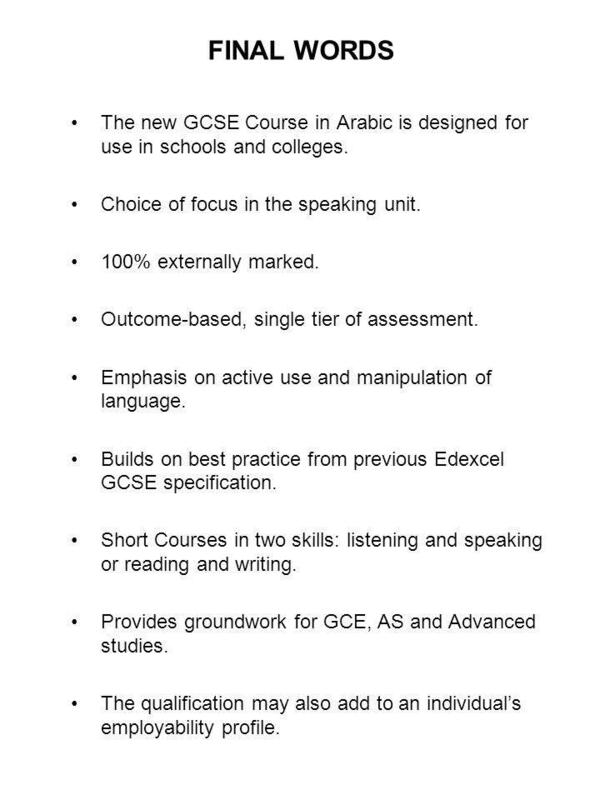 The Edexcel GCSE Short Course in Written Arabic is formed of these two units: Reading and Writing. It is possible to amalgamate the results from the two Short Courses to form one complete GCSE qualification. The full GCSE qualification is available for first certification in 2011. 4 WHAT’S NEW IN THE ‘NEW’ GCSE SPECIFICATION? 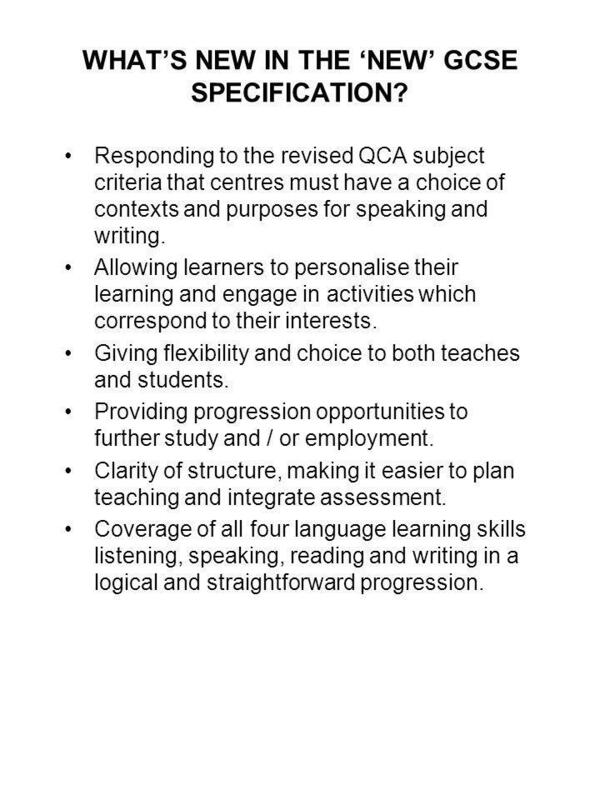 Responding to the revised QCA subject criteria that centres must have a choice of contexts and purposes for speaking and writing. Allowing learners to personalise their learning and engage in activities which correspond to their interests. Giving flexibility and choice to both teaches and students. Providing progression opportunities to further study and / or employment. Clarity of structure, making it easier to plan teaching and integrate assessment. Coverage of all four language learning skills listening, speaking, reading and writing in a logical and straightforward progression. 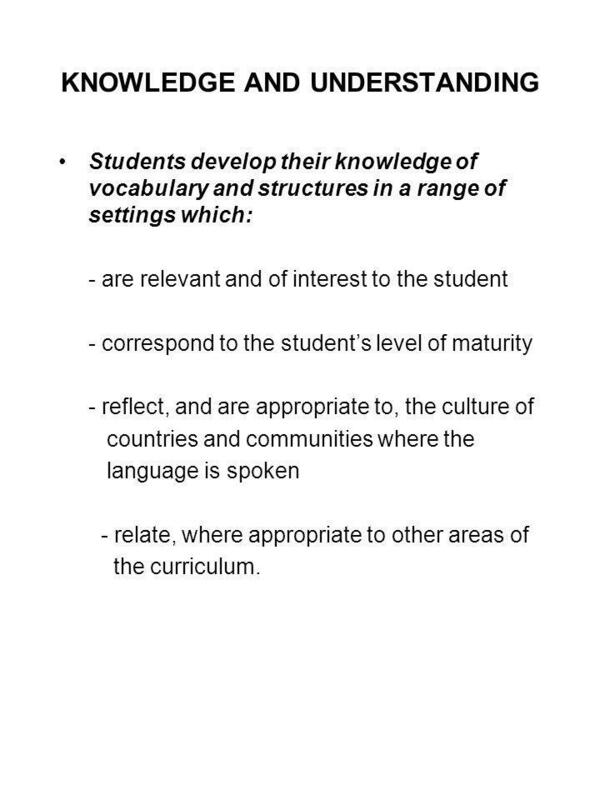 Students develop their knowledge of vocabulary and structures in a range of settings which: - are relevant and of interest to the student - correspond to the student’s level of maturity - reflect, and are appropriate to, the culture of countries and communities where the language is spoken - relate, where appropriate to other areas of the curriculum. develop the ability to listen and understand spoken Arabic in a range of contexts and a variety of styles communicate in speech for a variety of purposes read and respond to different types of written language communicate in writing for a variety of purposes understand and apply a range of vocabulary and structures develop language learning and communication skills which can be applied broadly. 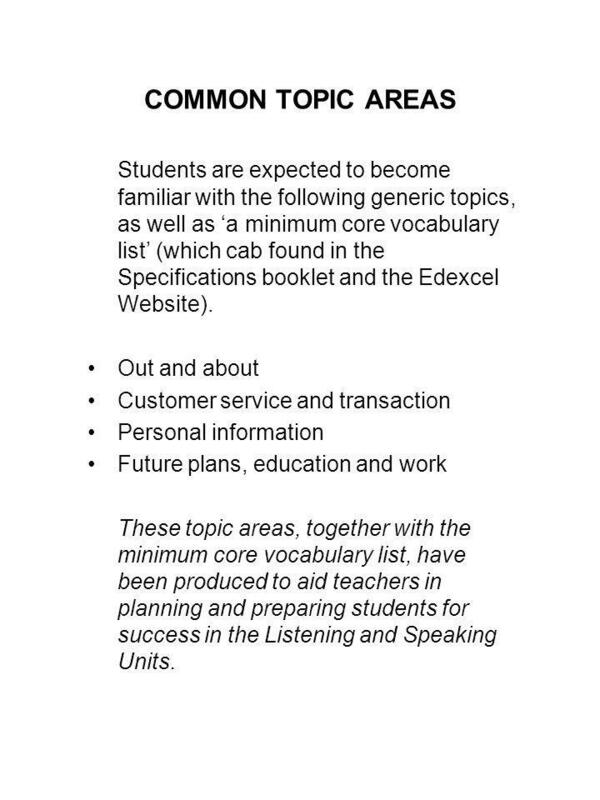 7 COMMON TOPIC AREAS Students are expected to become familiar with the following generic topics, as well as ‘a minimum core vocabulary list’ (which cab found in the Specifications booklet and the Edexcel Website). Out and about Customer service and transaction Personal information Future plans, education and work These topic areas, together with the minimum core vocabulary list, have been produced to aid teachers in planning and preparing students for success in the Listening and Speaking Units. 8 CHOICE OF THEMES For Speaking and Writing Units, content will relate to the following broad themes. 1. Media, Travel and Culture 2. Sport, Leisure and Work. 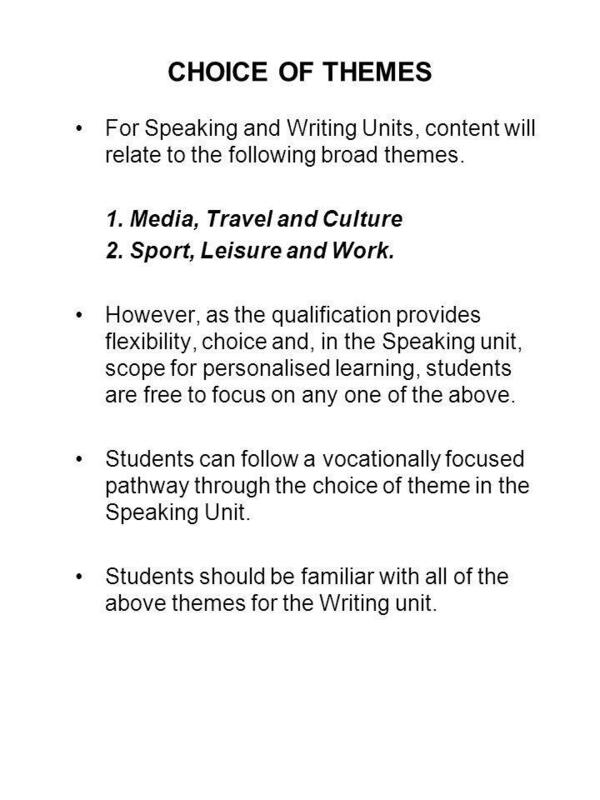 However, as the qualification provides flexibility, choice and, in the Speaking unit, scope for personalised learning, students are free to focus on any one of the above. Students can follow a vocationally focused pathway through the choice of theme in the Speaking Unit. Students should be familiar with all of the above themes for the Writing unit. Students should be familiar with a range of vocabulary relevant to all the common topic areas. Students should be accustomed to hearing Arabic language in a range of styles or different registers and in a variety of contexts, as appropriate to their age and level of understanding. Material used will feature both male and female voices and represent different age groups. Featured scenarios and situations are generally set in an Arabic speaking country or community and students are expected to develop appropriate cultural awareness and understanding. 11 SPEAKING IN ARABIC 5AR02 Teachers are encouraged to engage students in a variety of speaking activities as they develop their language skills. These may range from participating in a simple 1:1 conversation to a more complex group discussion or podcast production. There is a wide selection of subtopics of the main theme which are available to teachers to choose from. Students are expected to develop an appropriate awareness and understanding of the culture and society of Arabic speaking countries and communities as part of their Arabic language study. Students choose to talk about one or both of the following themes: Media , travel and culture Sport, leisure and work. These are broad themes and offer students scope to engage in activities that coincide with their interests, experiences and aspirations. 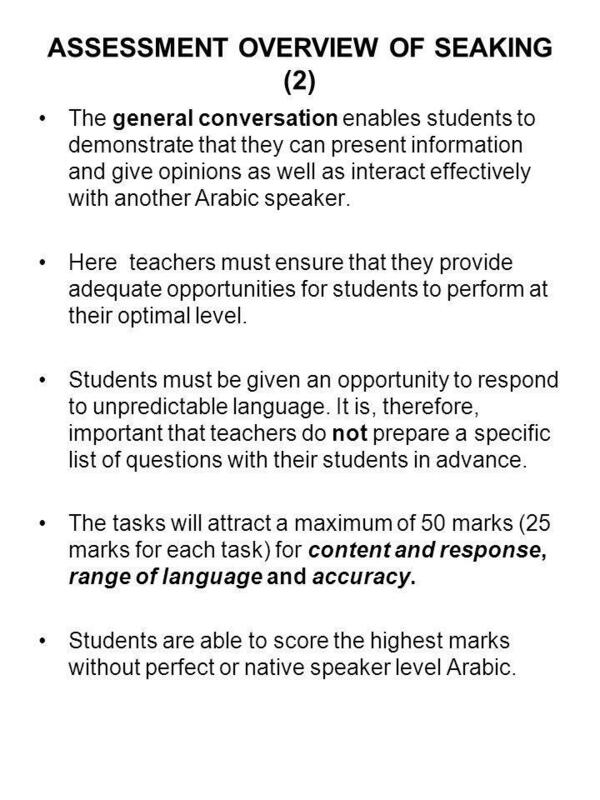 The assessment scenarios should provide opportunities for them to demonstrate knowledge and understanding of Arabic language and grammar as well as to present, discuss, interact, respond to questions, express feelings and give opinions in Arabic. Importantly, students, in negotiation with their teacher, can choose to relate their speaking assessments to either of the themes above. 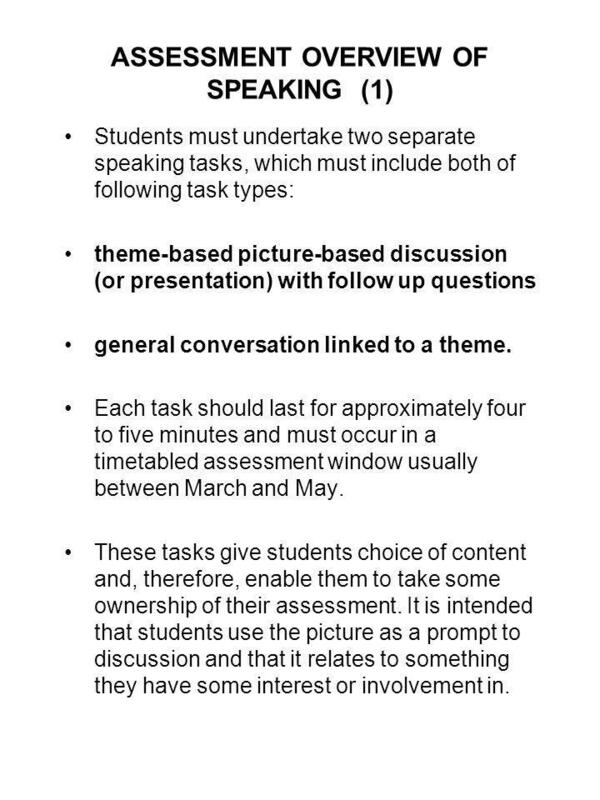 Students must undertake two separate speaking tasks, which must include both of following task types: theme-based picture-based discussion (or presentation) with follow up questions general conversation linked to a theme. Each task should last for approximately four to five minutes and must occur in a timetabled assessment window usually between March and May. These tasks give students choice of content and, therefore, enable them to take some ownership of their assessment. It is intended that students use the picture as a prompt to discussion and that it relates to something they have some interest or involvement in. 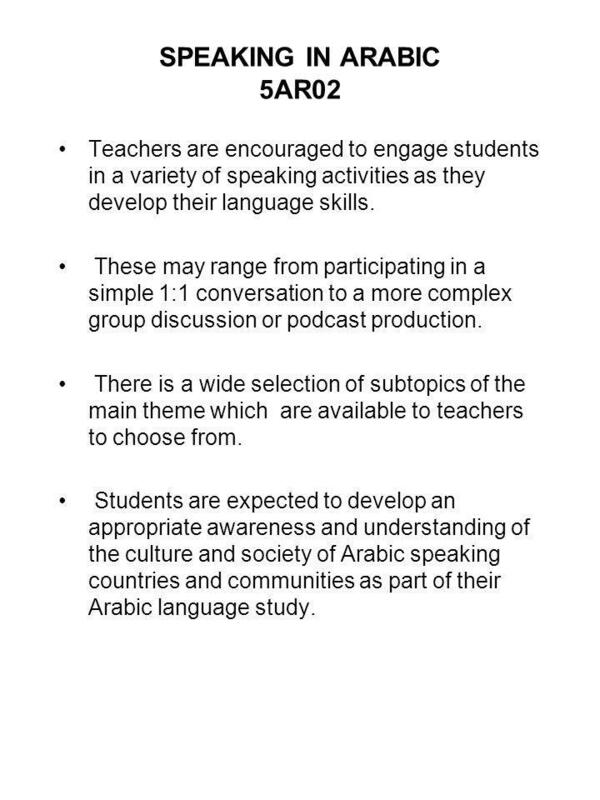 The general conversation enables students to demonstrate that they can present information and give opinions as well as interact effectively with another Arabic speaker. Here teachers must ensure that they provide adequate opportunities for students to perform at their optimal level. Students must be given an opportunity to respond to unpredictable language. It is, therefore, important that teachers do not prepare a specific list of questions with their students in advance. The tasks will attract a maximum of 50 marks (25 marks for each task) for content and response, range of language and accuracy. Students are able to score the highest marks without perfect or native speaker level Arabic. To prepare students adequately for this unit, teachers should exploit a range of vocabulary relevant to all the common topic areas. 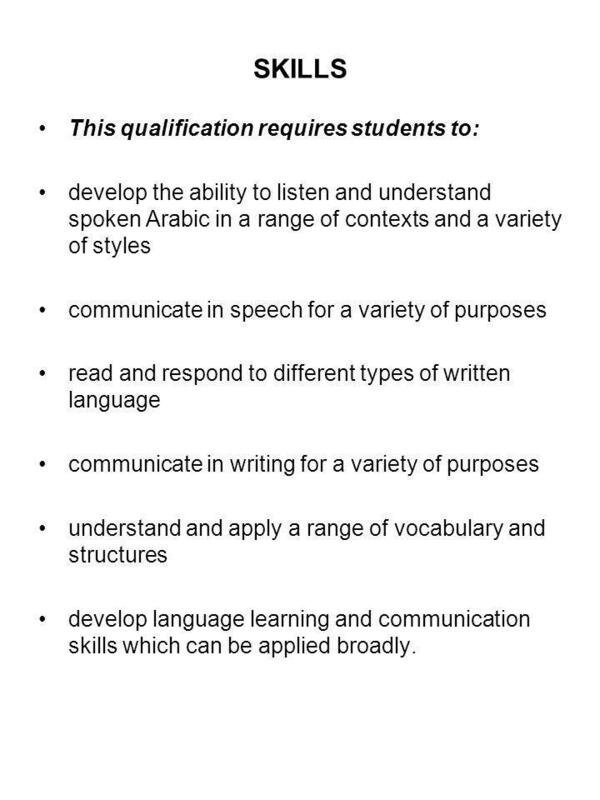 Students should be presented with Arabic language in a range of styles or registers and in a variety of different contexts as appropriate to their age and level of understanding. Students will be presented with different fonts and formats, for example, short printed messages, advertisements and messages. 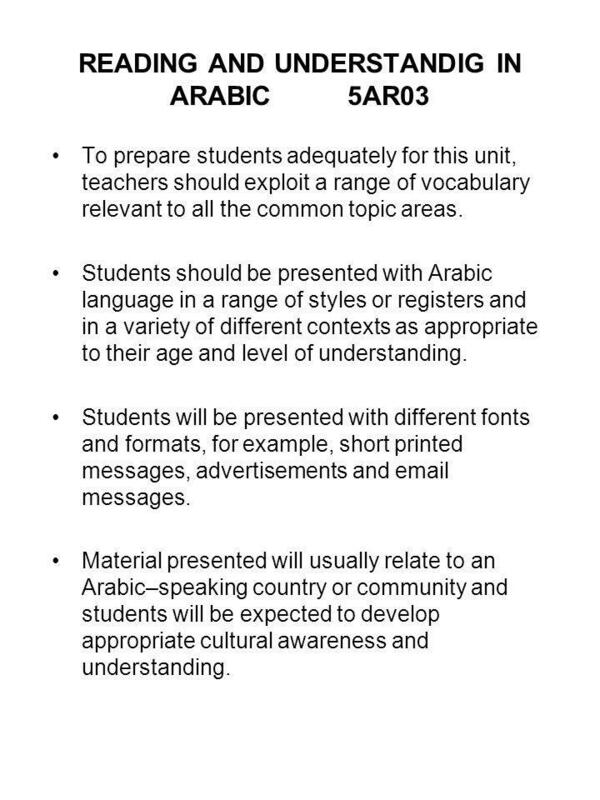 Material presented will usually relate to an Arabic–speaking country or community and students will be expected to develop appropriate cultural awareness and understanding. The examination paper features questions in English requiring non-verbal responses such as multiple choice and matching exercises. A mixture of visual and short verbal cues in English are provided. In addition, the paper awards marks for students’ short written English-language responses to certain questions. Questions appear in a mixed order rather than in order of increasing difficulty. Some questions may involve non verbal Arabic language responses. The paper carries a total of 50 marks. The question titles and rubrics will be in English throughout the paper. 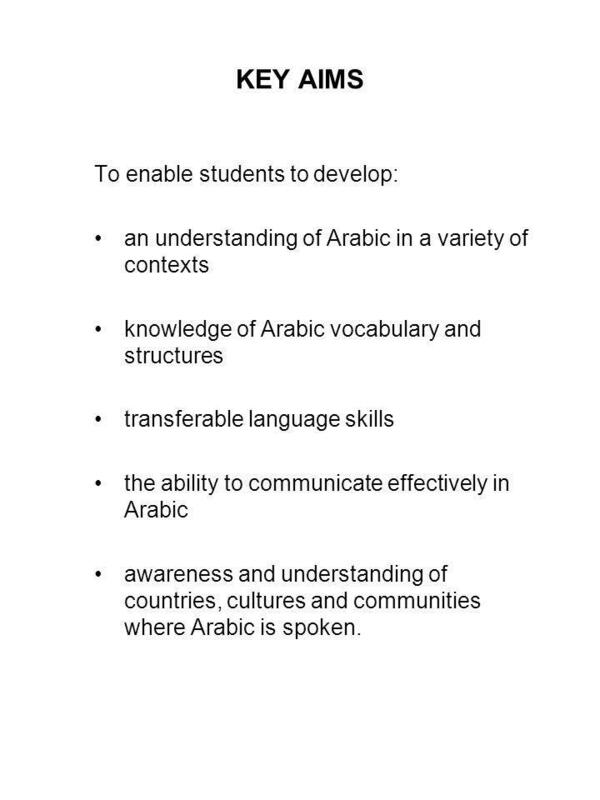 17 WRITING IN ARABIC 5AR04 To prepare students adequately for this unit, teachers should present and exploit a range of vocabulary relevant to all of the common topic areas. Students need to demonstrate that they can apply their knowledge and understanding of Arabic language and grammar to write effectively in Arabic for different purposes and in different contexts. 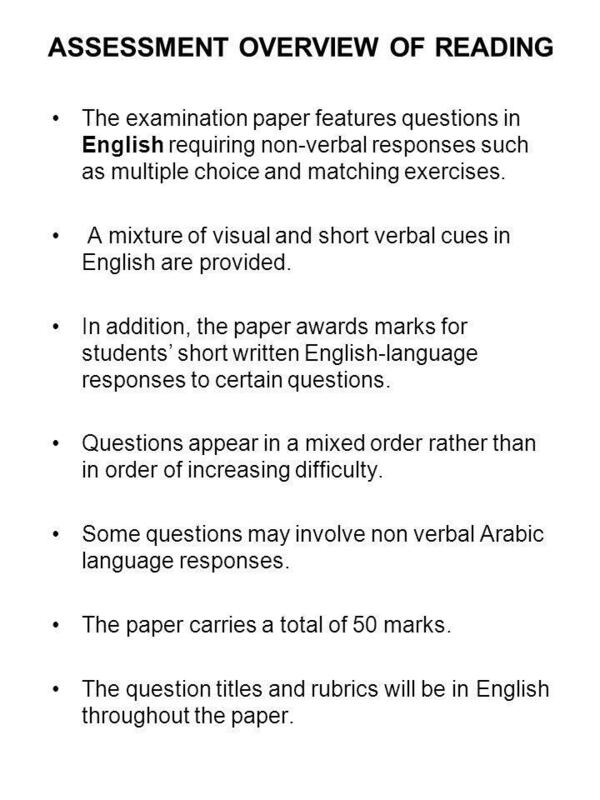 The examination paper requires students to undertake both a short task (for example, simple message) and a more extended Arabic writing task in which students can inform, describe, provide detail, express feelings and give opinions. The writing unit is externally assessed through an examination paper that consists of three tasks. The papers reward students for effective communication , knowledge and application of language, as well as accuracy. 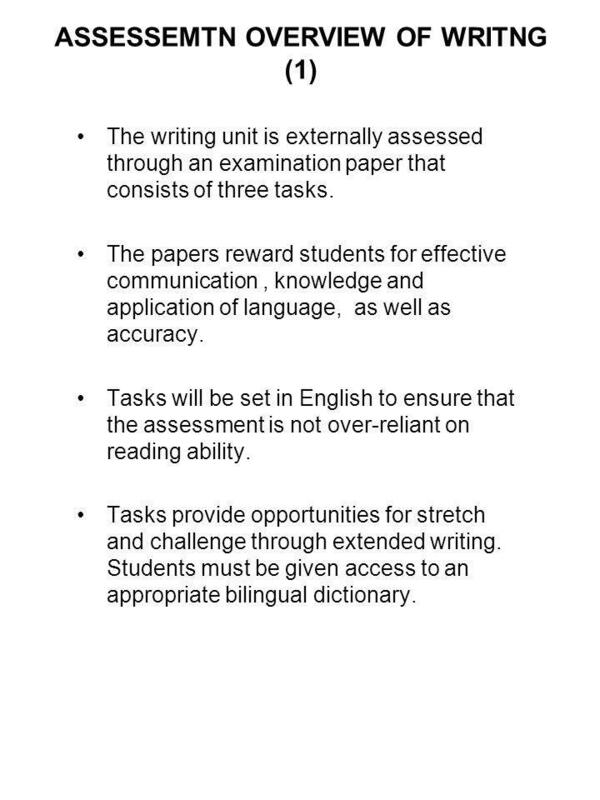 Tasks will be set in English to ensure that the assessment is not over-reliant on reading ability. Tasks provide opportunities for stretch and challenge through extended writing. Students must be given access to an appropriate bilingual dictionary. 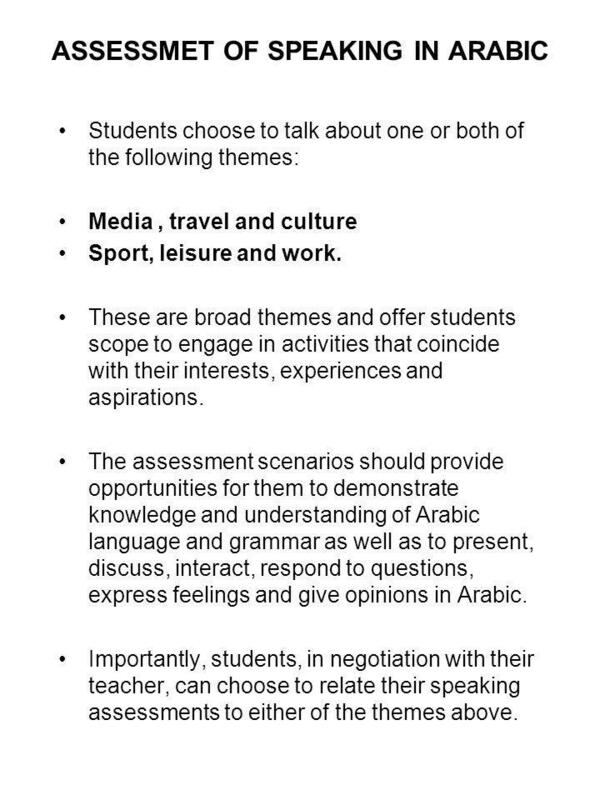 Task 1: Students are required to produce a short writing task in Arabic (30-70 words) in response to a choice of four questions that relate to both of the prescribed themes. The task is assessed for communication and knowledge and application of language only. 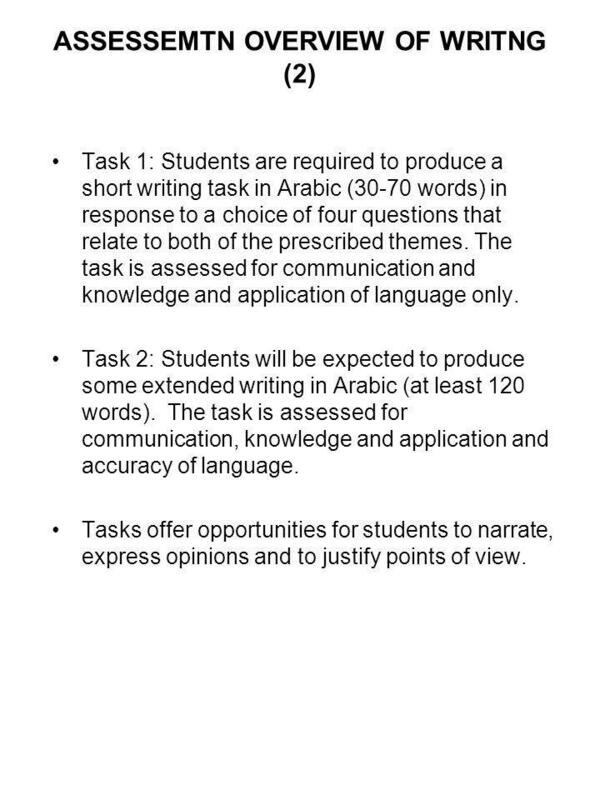 Task 2: Students will be expected to produce some extended writing in Arabic (at least 120 words). The task is assessed for communication, knowledge and application and accuracy of language. 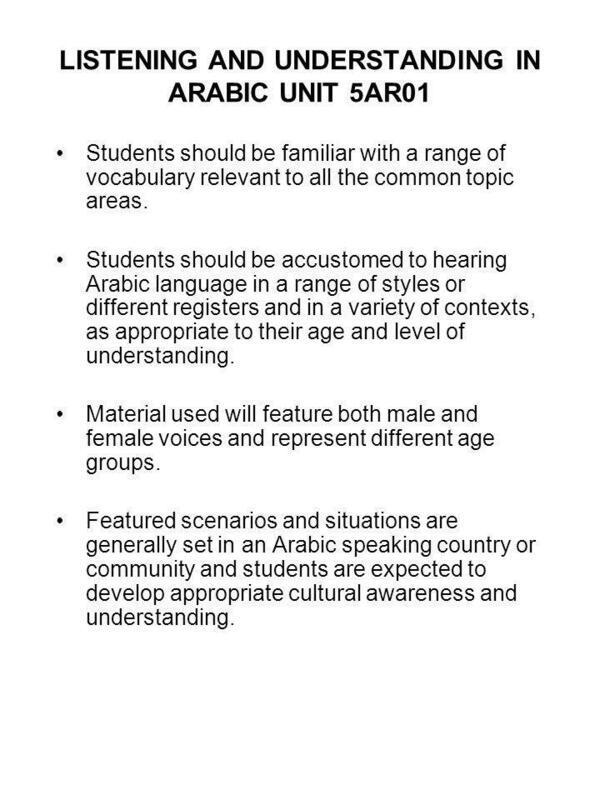 Tasks offer opportunities for students to narrate, express opinions and to justify points of view. 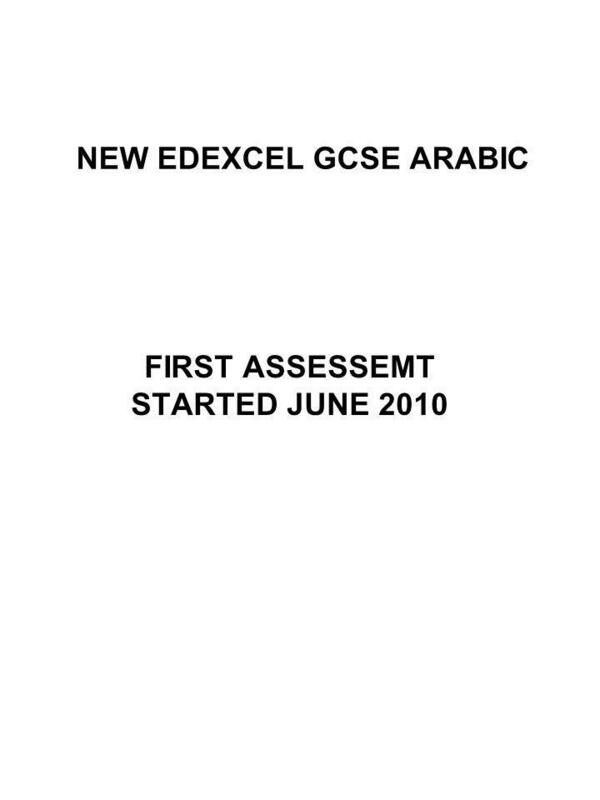 20 FINAL WORDS The new GCSE Course in Arabic is designed for use in schools and colleges. Choice of focus in the speaking unit. 100% externally marked. Outcome-based, single tier of assessment. Emphasis on active use and manipulation of language. Builds on best practice from previous Edexcel GCSE specification. Short Courses in two skills: listening and speaking or reading and writing. Provides groundwork for GCE, AS and Advanced studies. The qualification may also add to an individual’s employability profile. Download ppt "NEW EDEXCEL GCSE ARABIC"
Enabling successful communication of geographical understanding in written assessments AE SIG GA Conference 2013. GCSE Specification September 2009 GCSE Summary 4 skills – Listening, Speaking, Reading, Writing as usual There are now Themes for Speaking & Writing. Modern Languages: update on new qualifications. New National Qualifications Support learning – assessment follows the curriculum Support aims, purposes. OPTIONS AFTERNOON WHAT IS CAMBRIDGE IGCSE? The Cambridge International General Certificate of Secondary Education (IGCSE) is provided by University. N(T) Music Syllabus Implementation Workshop. Objectives of Workshop Interpret the GCE N(T) Music syllabus Plan the N(T) Music course Teach the N(T) Music. Functional Skills Support Programme OfQual Functional Skills Qualifications Criteria – Issued November 2009. Test of English as a Foreign Language - Measures English language proficiency and aptitude - College or university admissions requirement - World’s accessible. Modern Foreign Languages At High Storrs School.  We are part of the European Union, in which we can live, work or study in any one of 27 countries.
. GCSE Computer Science. General Information The spec has been developed with the support of Microsoft The specification and sample assessment materials.